Finely puree the raspberries, then sieve. Mix the raspberry puree with yogurt and vanilla sugar. Whisk the egg whites with a pinch of salt till firm. Gradually add sugar. Add the whisked egg mix to the raspberry yogurt mix. 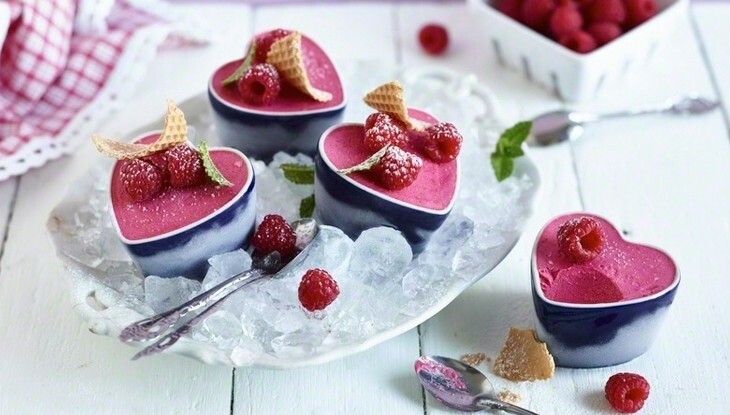 Fill 6 XS mini heart-shaped dishes to the edge with parfait and leave in the freezer for 4 hours. Remove the frozen parfaits from the freezer. Garnish with some fresh raspberries, mint and wafer bits and sprinkle with some powder sugar before serving.